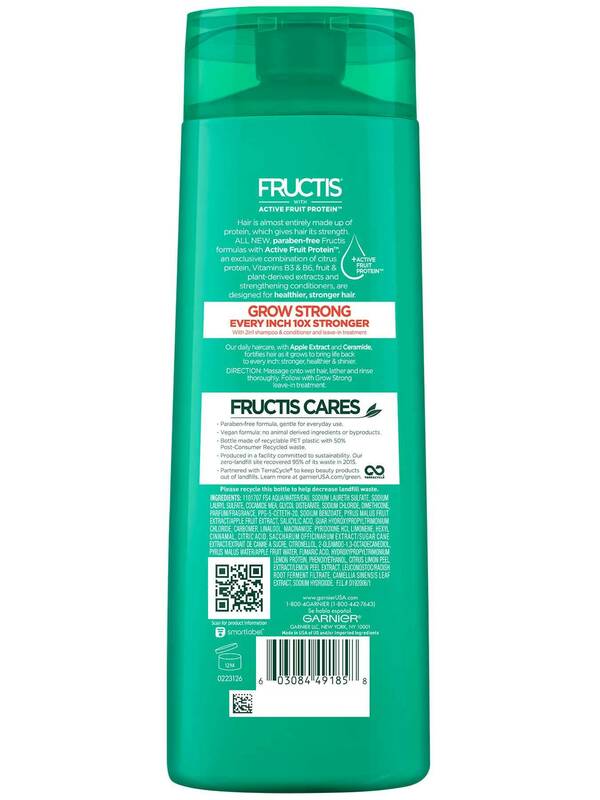 Fructis Grow Strong 2-in-1 Shampoo & Conditioner, with Apple Extract and Ceramide, fortifies hair as it grows to bring life back to every inch: stronger, healthier & shinier. Massage onto wet hair, lather and rinse thoroughly. Follow with Grow Strong leave-in treatment. Rated 5 out of 5 by Markay from Good product, hard to find though I have short hair and like to be low maintenance. I have tried other two-in-ones but they don’t condition enough. I like this stuff because it doesn’t weigh my hair down but leaves it quite soft. It smells nice as well. Not sure why I can no longer find it. Rated 1 out of 5 by All nicknames used from Not liking it at all It smells really good but after washing my long hair with this shampoo and conditioner and rinsing it well, my hair was not easy to brush and it left a nasty residue in my hair that rubs off on your handS when touched and feels like straw.. This is a NO. Rated 3 out of 5 by Juliashley from Like it not love it This product is nice is some spots. The smell is great, packing is great, shampoo it self is wonderful, but, I felt it was too heavy on my hair. This isn’t something you would be able to use everyday maybe two days a week. It did make my hair very smooth and silky. I do have damage hair and it made it look so nice! I like this product but only for a two day a week event. Rated 3 out of 5 by Jaelux from I'm not in love with it I've never tried a 2in1 shampoo before so I had high hopes. 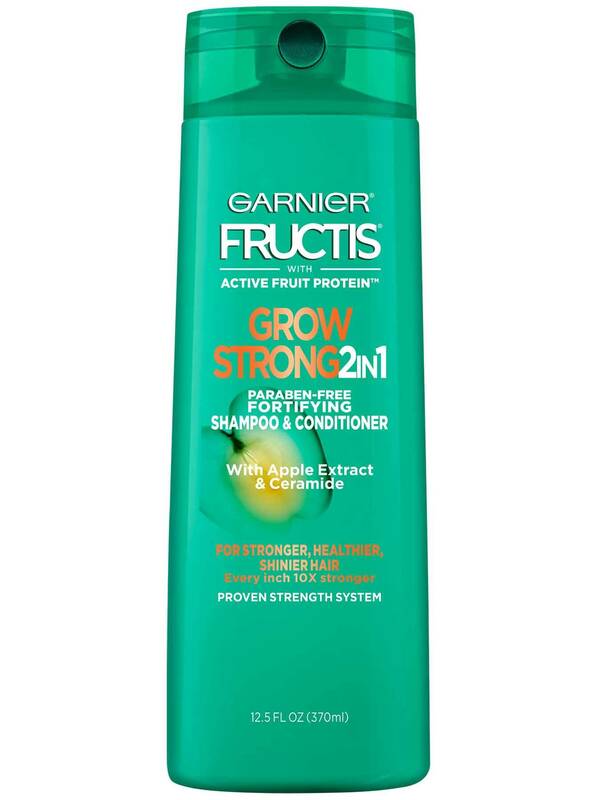 Garnier Fructis Grow Strong 2in1 let me down. While washing it lathered up really nice. But after rinsing it felt really dry. I had to follow up with a different conditioner. Rated 4 out of 5 by rosex7 from Garnier Fructis Grow Strong 2in1 I'm always looking for ways to save time on my daily hygiene routine.A 2 in 1 shampoo + conditioner seemed like a great fit to try.Garnier Fructis Grow Strong 2in1 has a great refreshing apple scent that I love and left my hair smelling awesome.I have long waist lenght hair that needs alot of attention, so while I think this product did a good job in making my scalp feel clean I need a seperate conditioner for my hair to feel its best.On the other hand my father has been using this shampoo too and has said he really likes it, so If your hair is easy to maintain and not very long this product would be a great choice for you. Rated 4 out of 5 by atorres90 from 2-in-1 Apple Extract I usually don't do 2-in-1 products because my hair does not go well with them. 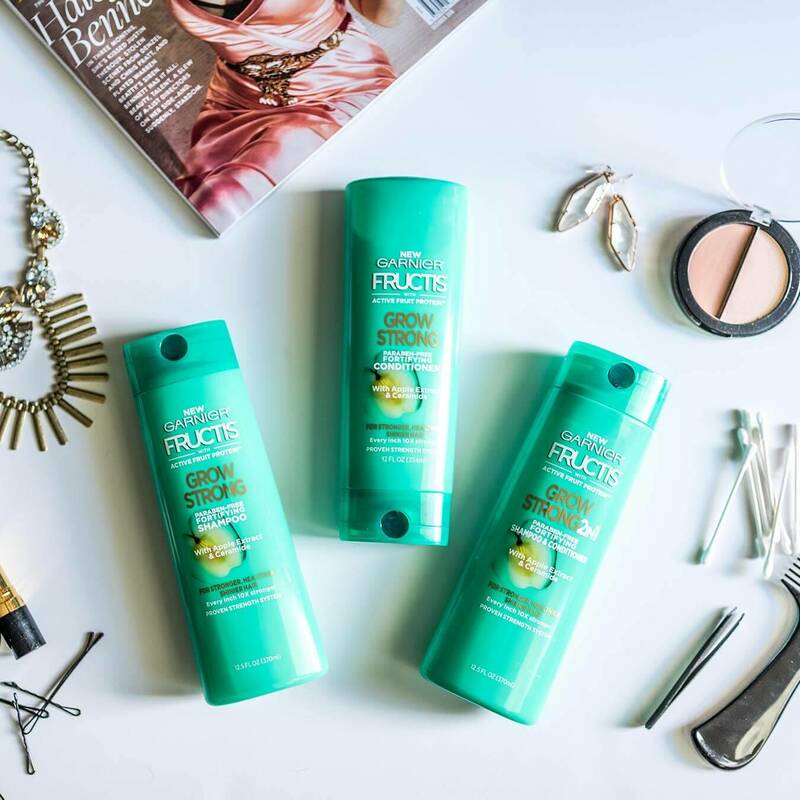 But when I tried the Garnier Fructis Grow Strong 2-in-1 I was very impressed. On the second day I notice less breakage than when I used my previous shampoo and conditioner. It has a wonderful apple smell that isn't too overpowering but it lingers throughout the day. The only downside is that my hair was still very frizzy and coarse. I did not try the leave in conditioner as stated on the directions so I might have to give that a try to take care of the frizziness. I was very happy with seeing that this 2-in-1 helped my hair and cut my shower time by afew minutes. Rated 5 out of 5 by alyssa10 from Best 2 in 1 I have ever used I just bought this to use at the gym and it controls my curly hair without being weighing it down or leaving it flyaway. Rated 5 out of 5 by Dsaint23 from Garnier Fructis 2in1 In my experiences With using shampoo and conditioners, I believe that I usually stick to certain ones. I thought I would branch out for once. I was very skeptical about using Garnier Fructis since it was my first time. I thought why not at least try it once. While in the shower I opened the bottle and immediately could smell it! The scent is Apple extract and it smells AMAZING! After using it the first time it just made my hair smell good all day! Not only did it smell good, my hair felt good and had a little bit more volume. My hair is normal, not super thick or super thin. I couldn't tell right away if I was going to love it forever or if it was a one-time thing since it was new. I kept using it for the past month, not every day but most days and I can now tell you that this product is Awesome! I feel my hair is thicker, stronger, and healthier. There are times where I feel it does dry your hair out for a little bit but it doesn't happen all the time so I am just assuming it could be my hair and not the product. Aside from the comments I get about my hair looking healthy and smelling fantastic, I would personally recommend this product!